Developing Grid User Interface Components Portlets, gadgets, etc. 1 Developing Grid User Interface Components Portlets, gadgets, etc. 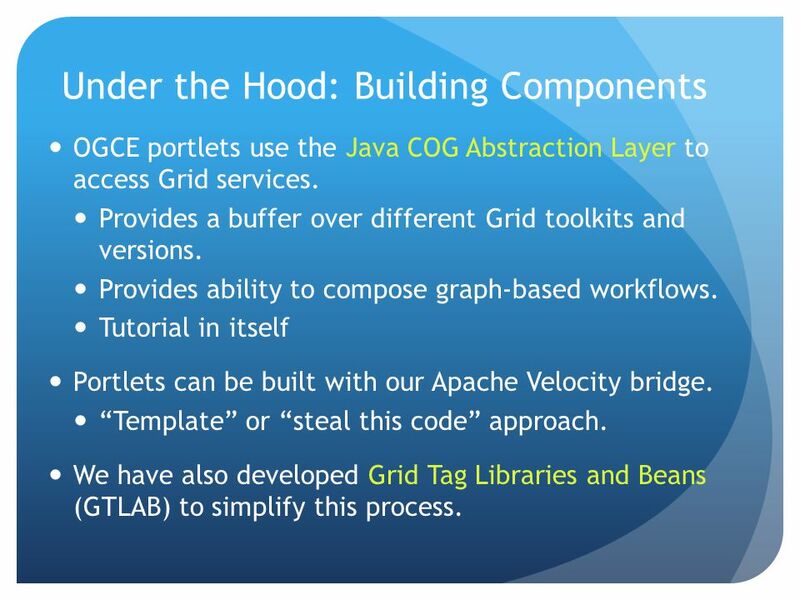 2 Under the Hood: Building Components OGCE portlets use the Java COG Abstraction Layer to access Grid services. Provides a buffer over different Grid toolkits and versions. Provides ability to compose graph-based workflows. 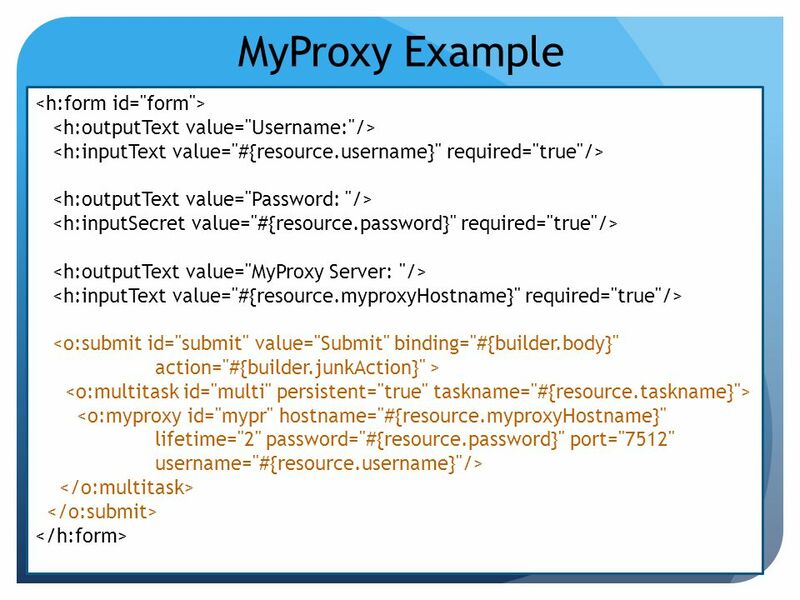 Tutorial in itself Portlets can be built with our Apache Velocity bridge. 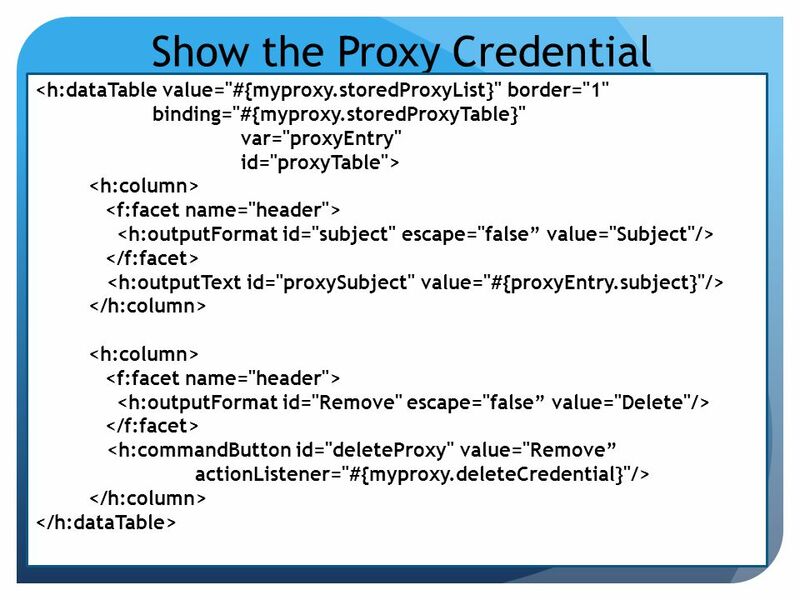 “Template” or “steal this code” approach. 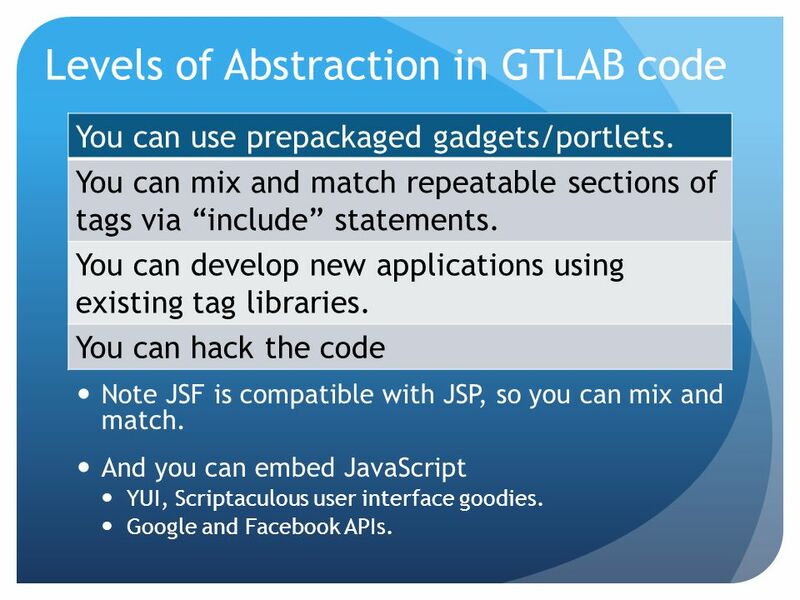 We have also developed Grid Tag Libraries and Beans (GTLAB) to simplify this process. 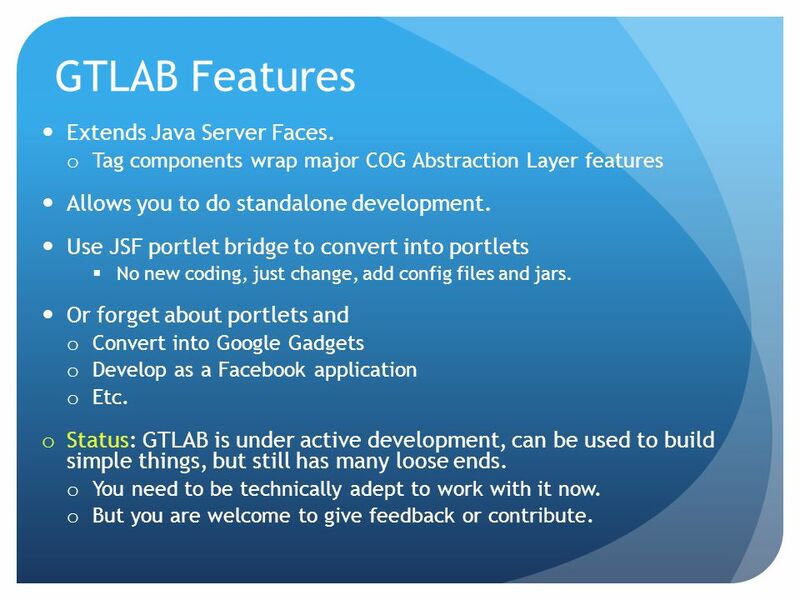 3 GTLAB Features Extends Java Server Faces. 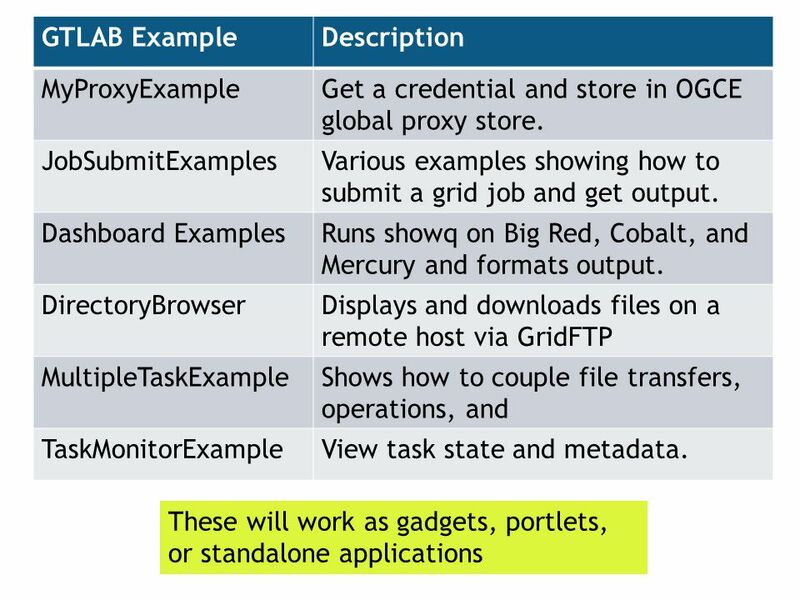 o Tag components wrap major COG Abstraction Layer features Allows you to do standalone development. Use JSF portlet bridge to convert into portlets  No new coding, just change, add config files and jars. Or forget about portlets and o Convert into Google Gadgets o Develop as a Facebook application o Etc. o Status: GTLAB is under active development, can be used to build simple things, but still has many loose ends. o You need to be technically adept to work with it now. o But you are welcome to give feedback or contribute. 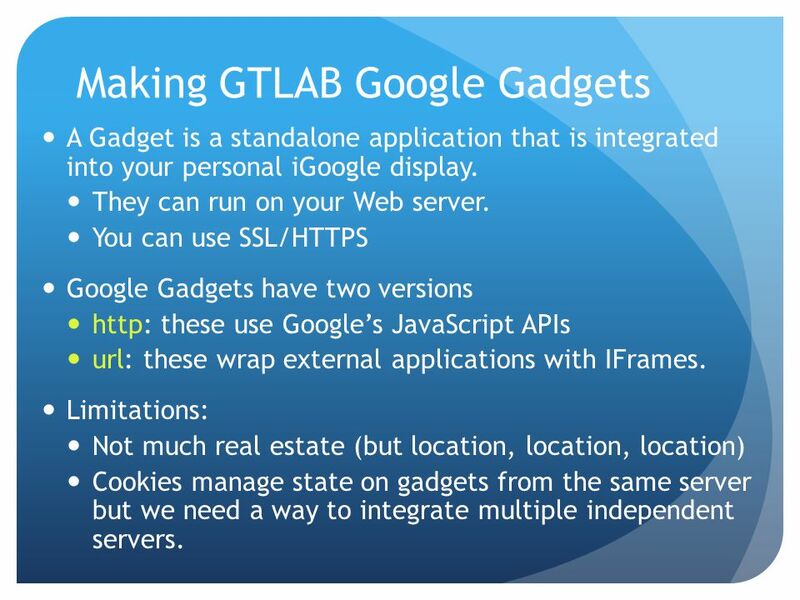 10 GTLAB Gadgets Code Base GTLAB Portlets Code Base Tomcat Web Server Tomcat Web Server + Portlet Container iGoogle Client Aggregator Compile and deploy into server Decorate with bridge and container jars, xml config files. 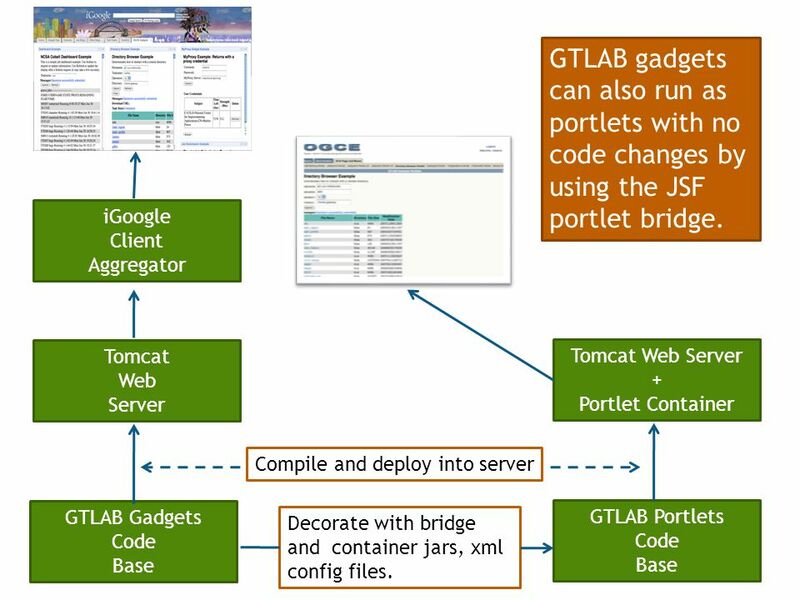 GTLAB gadgets can also run as portlets with no code changes by using the JSF portlet bridge. 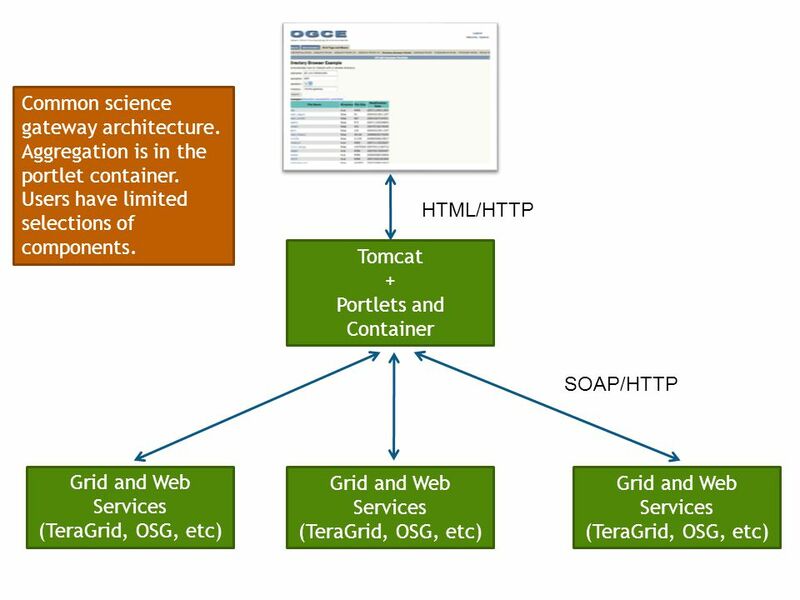 11 Tomcat + Portlets and Container Grid and Web Services (TeraGrid, OSG, etc) Grid and Web Services (TeraGrid, OSG, etc) Grid and Web Services (TeraGrid, OSG, etc) HTML/HTTP SOAP/HTTP Common science gateway architecture. Aggregation is in the portlet container. Users have limited selections of components. 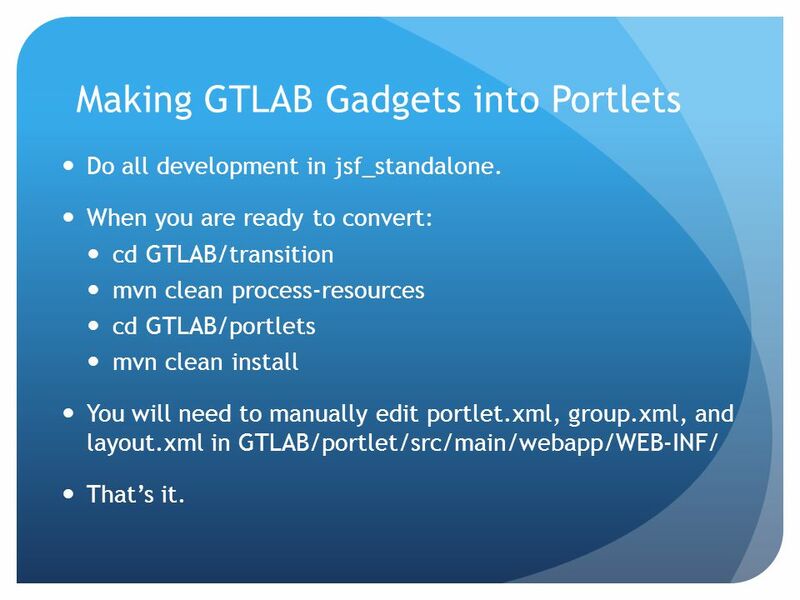 13 Making GTLAB Gadgets into Portlets Do all development in jsf_standalone. 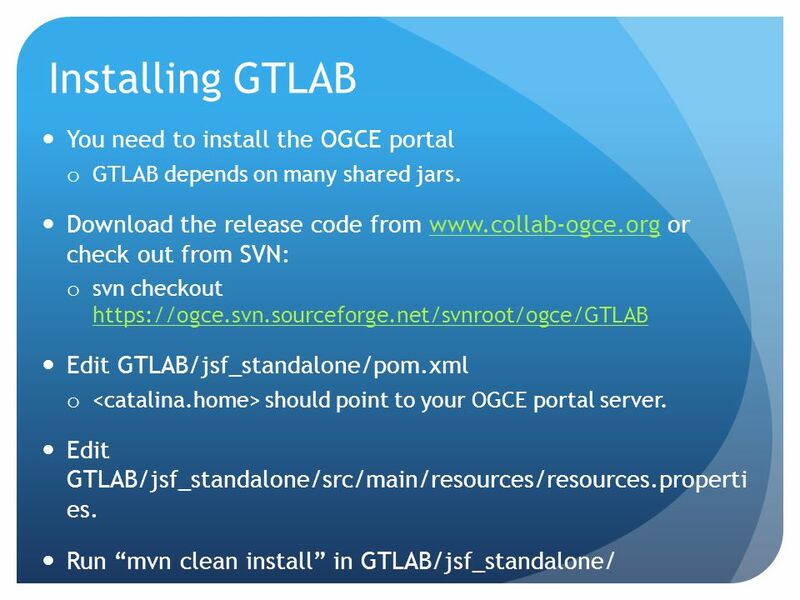 When you are ready to convert: cd GTLAB/transition mvn clean process-resources cd GTLAB/portlets mvn clean install You will need to manually edit portlet.xml, group.xml, and layout.xml in GTLAB/portlet/src/main/webapp/WEB-INF/ That’s it. 15 Click “Add stuff” and then “Add feed or gadget”. 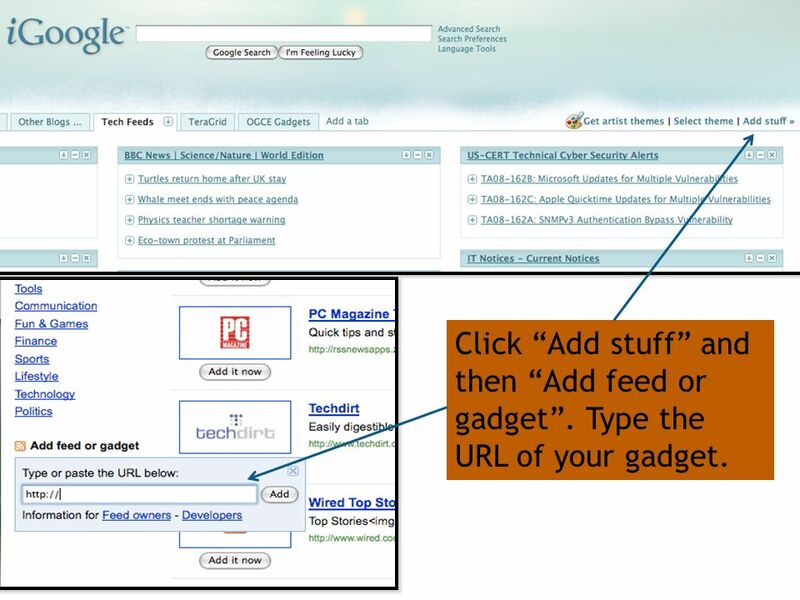 Type the URL of your gadget. 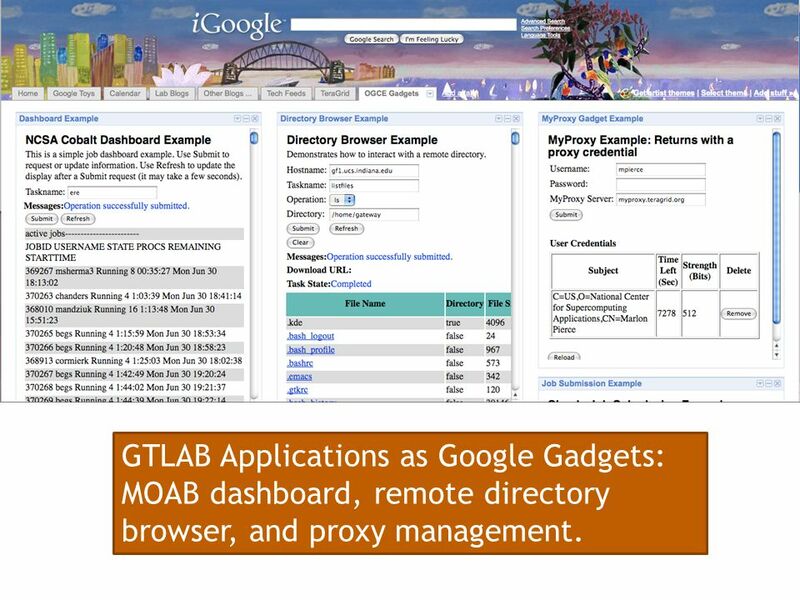 16 GTLAB Applications as Google Gadgets: MOAB dashboard, remote directory browser, and proxy management. 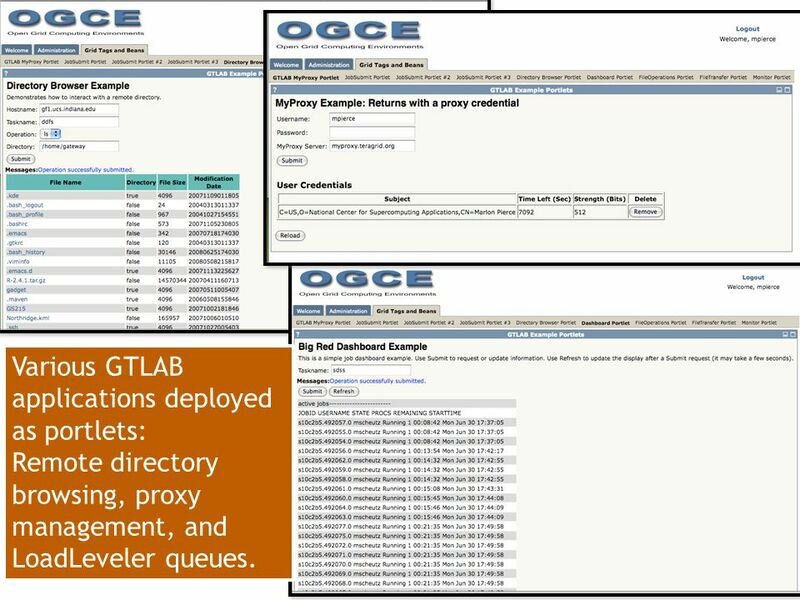 17 Various GTLAB applications deployed as portlets: Remote directory browsing, proxy management, and LoadLeveler queues. 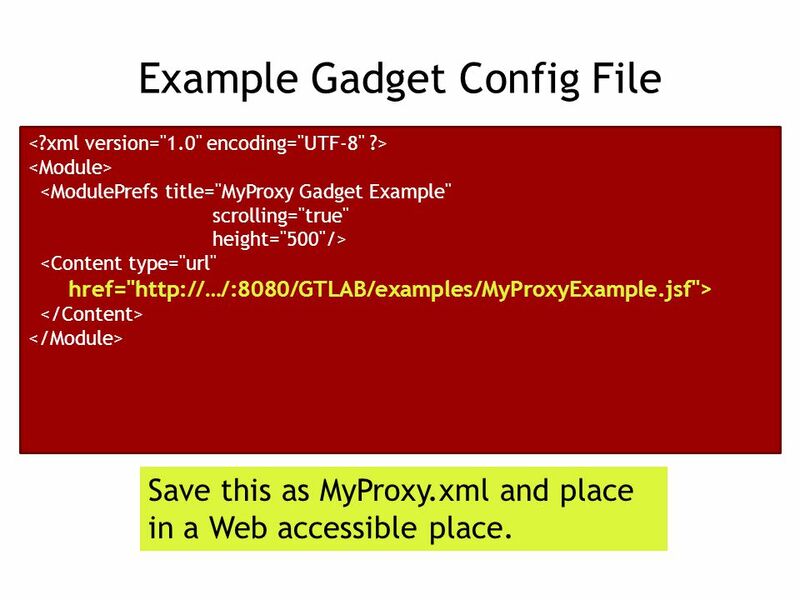 18 Example Gadget Config File <ModulePrefs title="MyProxy Gadget Example" scrolling="true" height="500"/> <Content type="url" href="http://…/:8080/GTLAB/examples/MyProxyExample.jsf"> Save this as MyProxy.xml and place in a Web accessible place. 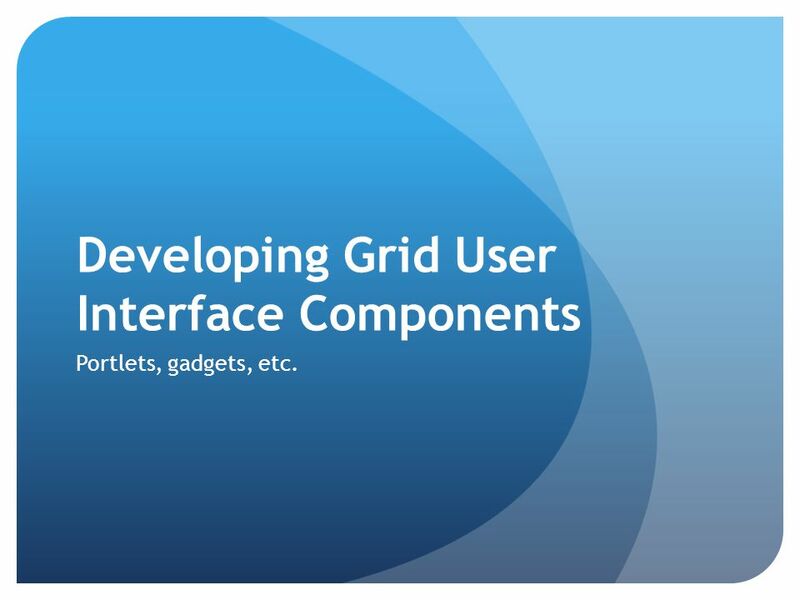 Download ppt "Developing Grid User Interface Components Portlets, gadgets, etc." Samsung Smart TV is a web-based application running on an application engine installed on digital TVs connected to the Internet. Introduction to Maven 2.0 An open source build tool for Enterprise Java projects Mahen Goonewardene. 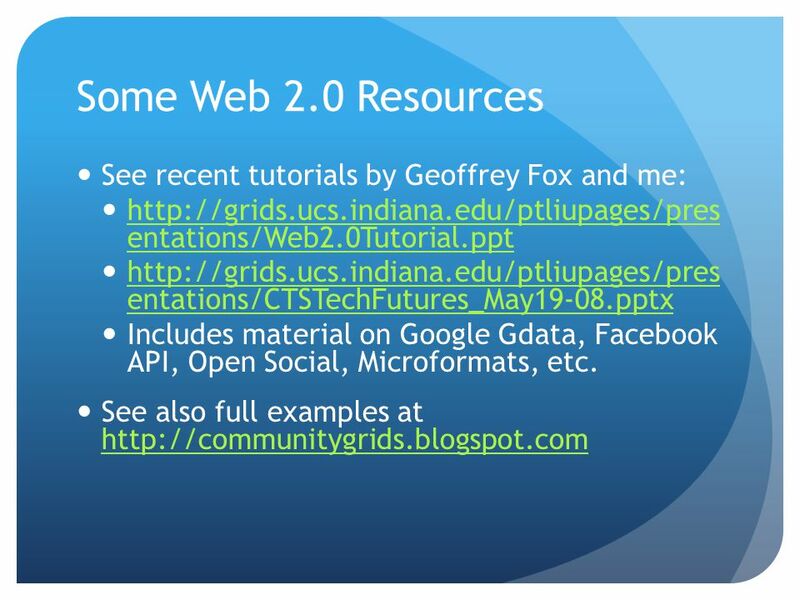 Using the Collaborative Tools in NEESgrid Charles Severance University of Michigan. Developing in CAS. Why? 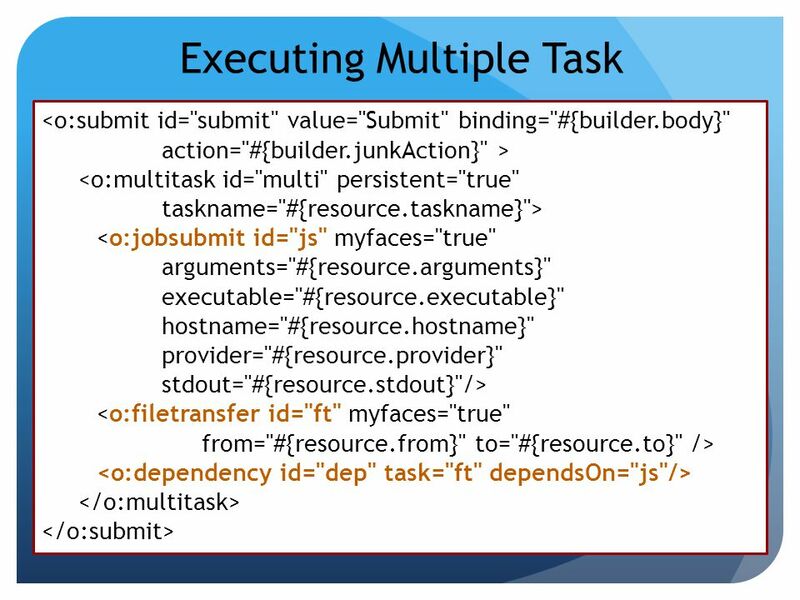 As distributed you edit CAS 3 with Eclipse and build with Maven 2 – Best Practice for Release Engineering – Difficult edit-debug. Building and Testing OGCE Software on the NMI Build and Test Facility Marlon Pierce Indiana University. 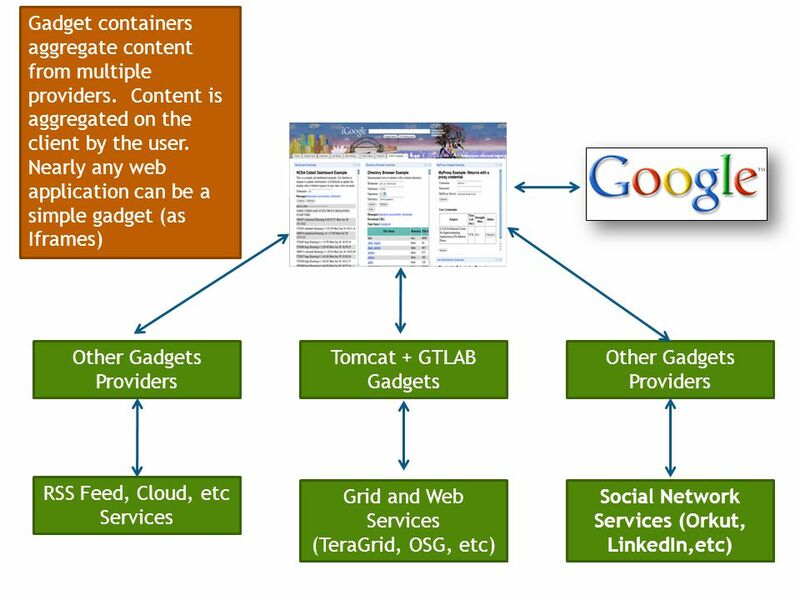 Building Grid Portlets with GTLAB Mehmet A. Nacar and Marlon E. Pierce Community Grids Lab Indiana University. Test Automation Framework Ashesh Jain 2007EE50403 Manager Amit Maheshwari. OGCE Overview: Portals, Services, Workflows, Gadgets, and Tags Marlon Pierce (IU), Suresh Marru (IU), Gregor von Laszewski (RIT), Mary Thomas (SDSU), Nancy. Building QuakeSim portlets with GTLAB Mehmet A. Nacar 1, Marlon E. Pierce 1, Andrea Donnellan 2, and Geoffrey C. Fox 1 1 Community Grids Lab, Indiana University. Building Science Gateways Marlon Pierce Community Grids Laboratory Indiana University. Open Grid Computing Environments Marlon Pierce, Suresh Marru, Gregor von Laszewski, Mary Thomas, Maytal Dahan, Gopi Kandaswamy, and Wenjun Wu.